Stuck on the road to Trongsa! Bhutan has only a few paved roads across the country between Thimphu and any place to the east. The main road is a sometimes one lane, sometimes two lane thoroughfare that includes passenger vehicles, cargo trucks, construction vehicles and farm equipment. Travel on this road is exciting and on virtually every turn, a fascinating dance between truck and car, bus and dump truck. Our route today included the ubiquitous landslide or mudslide, and the occasional vehicle breakdown. Driving about an hour past Punakha, a truck carrying about 20 tons of rocks broke down as it headed downhill from a rock slide. The truck blocked almost the entire road. Behind the truck were about 40 vehicles of varying shapes and sizes, the largest were more trucks carrying rocks away from a landslide up the road. 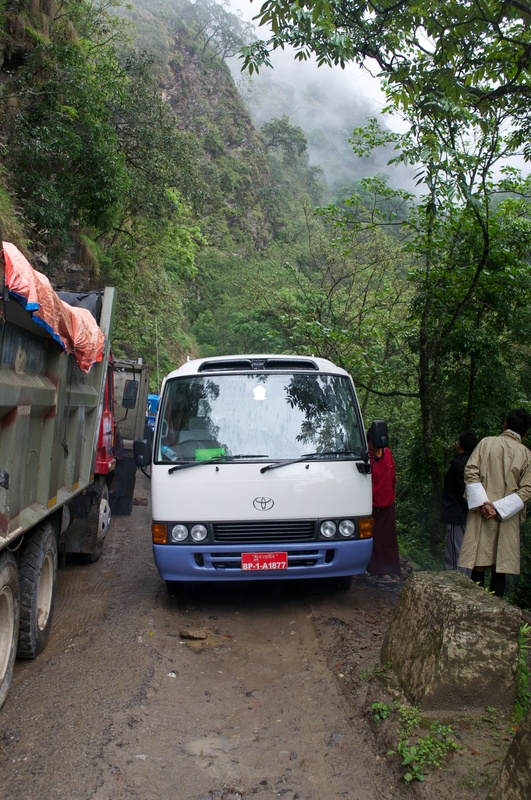 Vehicles traveling from Punakha (headed east) creeped past the truck; our vehicle, however, came to a dead stop, blocking the east bound lane (more like a foot path at this point). We were, literally trapped in the vehicle as the door to the outside was within inches of a cliff that dropped about 1000 feet through thick forest to the river below. While we waited, a busload of police trainees, monks, drivers, and some other folks trapped in their own vehicles headed west, came to survey the situation. In a matter of minutes about thirty people gathered in front of our bus, pointing, and shaking their heads. To our right, inches from the windows, were a line of ten trucks filled with rocks….everyone speculated, could we pass the dead truck and make it past the line of cars, busses, and other vehicles? We crept, very slowly forward, the wheels of our vehicle on the edge of the abyss. As we inched forward we made it past the stalled truck and about 30 feet later, stopped again by another truck, pointed downhill at a diagonal. At this point, we exited our bus, and all of us jumped out, realizing that it was better to have our feet firmly on land than at the mercy of a bus. To better set the scene let me explain one more thing: it was raining, slightly, and had been raining for days. The road was more mud track than road, and the hill on the south side had collapsed in places, rocks and mud blocking sections of the pavement. In addition, as we walked along the now muddy road, the unpaved portions of the road to the north showed huge cracks in the dirt, looking as if, at any minute, the entire hill would give way to a mudslide, taking us all with it. So, the question you may have is: was it dangerous? Yes and no. You could see where the road had taken a beating from the mud and rocks that covered its surface, but somehow the road felt stable….I kept us all away from the edge (as much as Cole wanted to peek at the steep drop to our north), and we walked down the road, our bus trying to negotiate the track. After about 45 minutes, cars and vehicles had inched to the side, allowing our bus, and all of the vehicles behind us, to make their way east. We cheered our driver, knowing that he had done yeoman’s work and performed a task much beyond our humble driving abilities. Stay glued for more excitement to come! < Previous To the Temple of the Divine Madman!